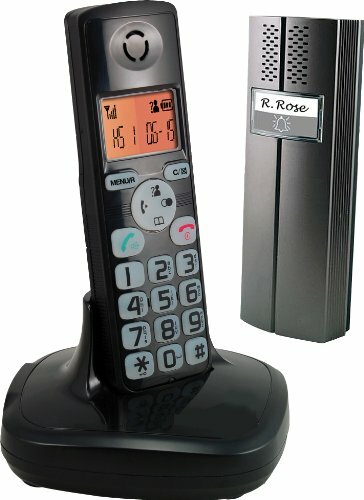 This wireless system allows the user to answer the door or telephone from the same cordless digital telephone handset. When the doorbell rings, the user can have a two-way conversation with the person at the door, in safety, before deciding whether to answer it. Different ring tones can be set up to identify doorbell activation or a telephone call. With a clear, backlit, LCD display, the telephone unit itself has 10 ring tones with 6 ring volume levels. It has hands free speakerphone and mute functions. The internal clock has alarm and snooze functions. It has a 50 number phone book, caller ID, and a redial memory for up to 10 entries. The internal menu is available in 13 languages. The system can be extended by up to 4 handsets per doorbell. The intercom/ doorbell unit is waterproof (IP56 rated) and can be placed up to 300m from the telephone handset.